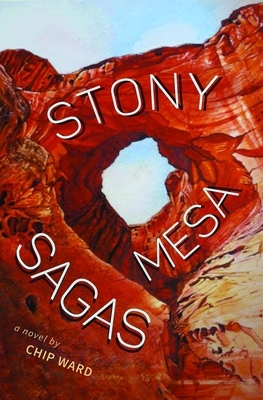 Pursued by a mad assassin after their arrest for chaining themselves to a mining site gate, Luna Waxwing and Hip Hop Hopi seek refuge in the remote village of Stony Mesa. Immersed in the diverse cultures and conflicts of the contemporary West, the young couple struggles to understand the wild lands that surround them, while trying to understand one another. There are many versions of how that Fourth of July celebration in Stony Mesa, now known as the Apple Days Riot, unraveled but all agree that it started when Otis Dooley hit Bo Hineyman square in the back with a fresh horse turd. Splat And the rest is history. After living for four years in wilderness, Chip Ward moved to the edge of an environmental sacrifice zone, where he organized and led several campaigns to make polluters accountable. He co-founded HEAL Utah and served on the board of the Southern Utah Wilderness Alliance for several years. Starting as a bookmobile librarian, Ward ended his library career as the assistant director of the Salt Lake City Public Library. He is the author of two books, Canaries on the Rim: Living Downwind in the West and Hope's Horizon: Three Visions for Healing the American Land. He writes regularly for Tomdispatch.com. His essay about homelessness, "How the Public Library Became the Heartbreak Hotel," is the inspiration for the movie The Public, now in production. After living for four years in wilderness, Chip Ward moved to the edge of an environmental sacrifice zone where he organized and led several campaigns to make polluters accountable. He co-founded HEAL Utah and served on the board of the Southern Utah Wilderness Alliance for several years. Starting as a bookmobile librarian, Ward ended his library career as the assistant director of the Salt Lake City Public Library. He is the author of two books, Canaries on the Rim: Living Downwind in the West and Hope's Horizon: Three Visions for Healing the American Land. He writes regularly for Tomdispatch.com. His essay about homelessness, "How the Public Library Became the Heartbreak Hotel," is the inspiration for the movie The Public, now in production.